Near the end of March, I was reading an article in The Sapling about the wonderful Desna Wallace, librarian at Fendalton Open-Air School in Christchurch. Desna described her most successful reading promotion, which involved key rings and tags that she issued to her Year Six book club. I thought that sounded fantastic, and promptly stole the idea! I am pleased to say that in the few weeks it has been running in the Terrifying Night Howlers (our book club) it has been equally engaging. We had a rather fragmented start to the book club, with me flying off to the UK soon after we got started. We had over 30 Year 5 & 6 students at one point, but I knew from experience that not everyone stays. However, it didn't drop as much as I thought it would, and it was hard to have enough time for everyone to contribute to our conversations. I trialled using the Seesaw app to communicate with students, to try and extend the conversations outside of school. Teachers throughout our school use Seesaw in their classrooms so I knew everyone would be familiar with the app. I had some success with it, but not as much as I wanted! I am going to try and sort out some logistical details and give it another go. This term, I have ended up splitting the club in two, with 12-14 students in each, to make it more manageable. We meet on Thursday and Friday at morning tea. Both groups are still called the Terrifying Night Howlers - the name the kids chose for themselves last term. I never get tired of hearing that over the intercom! 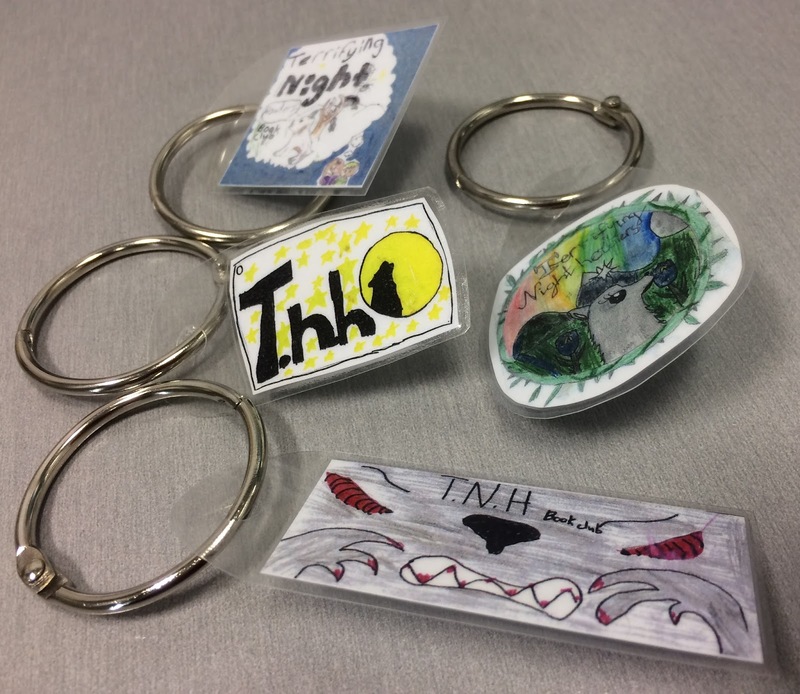 I had some of the students, those who were keen, make a Terrifying Night Howlers logo for the first tag on their key ring. We ended up with four designs, which we shrunk down and laminated, and the other kids chose the ones they wanted. The first key ring challenge took place over two weeks and involved shadowing. I was very fortunate to have been sent the books in the FCBG book awards. The students read the picture books to each other and then voted for their favourites. I have to admit I have never done shadowing with my book clubs before but I was inspired by how keen librarians in England were on this process. Our students really enjoyed discussing the books and voting on their favourites. The overwhelming favourite of both groups was Chicken Nugget by Michelle Robinson and Tom McLaughlin. I will be interested to see what the children in England, Scotland and Wales have selected when the winner is announced on 10 June. I also plan on shadowing the NZ Book Awards for Children and Young Adults. 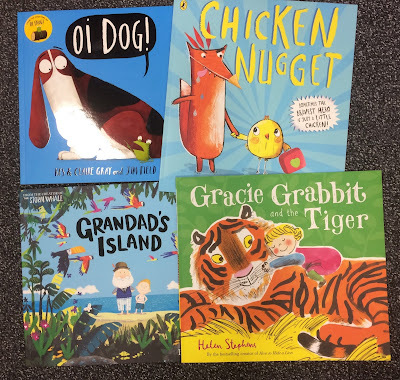 I was hoping we could look at the junior fiction but there's not a lot of time between when the shortlist is announced and when the awards are announced, particularly when there are holidays in between. It looks like it will need to be picture books again. There is a link to generic activities you can do to work with the awards finalists. Next week's key ring challenge will earn the students a "Film Star" tag. I have kept in contact on Twitter with a teacher in Norfolk and we are going to swap videos of the students giving a short pitch for their favourite books. I'm really not sure whether we will be able to do the filming in 30 mins but we will give it a try! I am enjoying creating the key ring tags using Canva, which I use to design a lot of my posters as well. The '5' will be for students when they have attended five book club sessions. We are having a lot of fun with the key ring challenge - thanks Desna!